Amidst all the great pulp thrills and features in Sky Fighters, they ran a true story feature collected by Ace Williams wherein famous War Aces would tell actual true accounts of thrilling moments in their fighting lives! This time it’s American Lieutenant Alan Winslow’s Most Thrilling Sky Fight! Alan Winslow first went oyer to France as a member of tho American Ambulance Section serving with the French Army. After America entered the war he was transferred to the American Army. 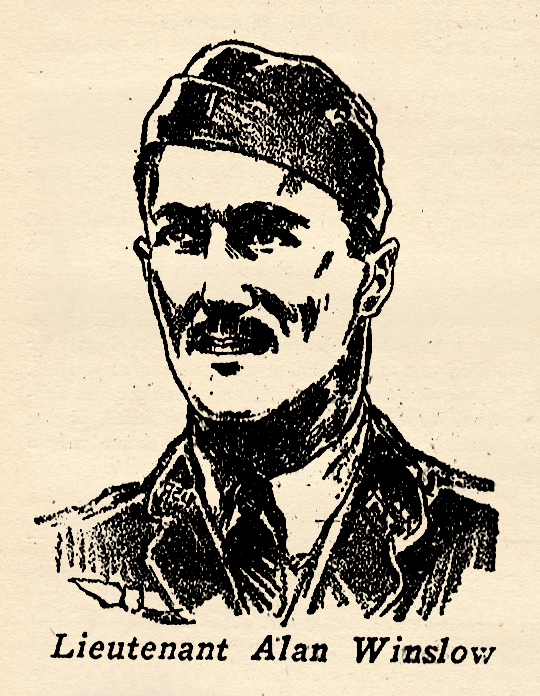 When the American Air Service under command of Colonel Mitchell began definite duties on the Western Front, Alan Winslow had won his commission as a First Lieutenant and was assigned as a pilot in the 94th Aero Squadron, the famous “Hat in the Ring” outfit later made famous by Captain Eddie Rickenbacker. Lieutenant Winslow and Douglas Campbell were both inexperienced battle flyers, but it fell to their lot to be the first American flyers in an American Squadron under American command, to engage the enemy in actual combat. Winslow and Campbell downed their respective enemies within two minutes of one another in the same dogfight. Wlnslow’s opponent fell first, hence he is credited with the first American air victory. The account below was taken down by one of Winslow’s squadron mates. I DON’T know yet just how it happened. Our Spads were lined up on the deadline ready for a practice flight over the lines when the field sirens began to scream raucously. All of us rushed out to see what was the matter, looking naturally towards the front lines. Then the anti-aircraft guns began to pop and I saw white mushroom puffs just over the northern border of the field. Right in the midst of the archie bursts were two black winged planes flying towards our field. They weren’t more than 2,500 feet high. Campbell and I both rushed for our planes. When I got in the air I kited off towards the front in a climbing turn to get the Boche between me and their home lines. took the other. I fired a short burst from my guns to make sure they were clear, then dived in to the attack. The Boche gunner in the rear seat calmly swung his guns on me and opened up with a stream of tracer. I don’t know just what I did, but I ducked that burst somehow by agile maneuvering. When I redressed he was out of my sights, so I nosed up, renverscd and went back again with my fingers trembling over the Bow-dens, ready to fire the instant I lined him. But fearing a trick, I followed down after it until it crashed. Only then did I think about Campbell and the other Boche. I banked and climbed back to go to his assistance, and saw his Boche going down just like mine.